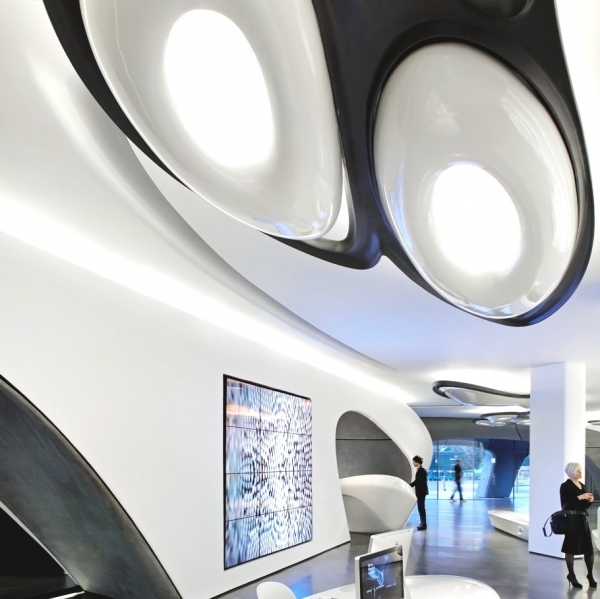 The architecture of Roca London Gallery, created by Zaha Hadid Architects, pulls inspiration from the many forms of water and its flexible nature. 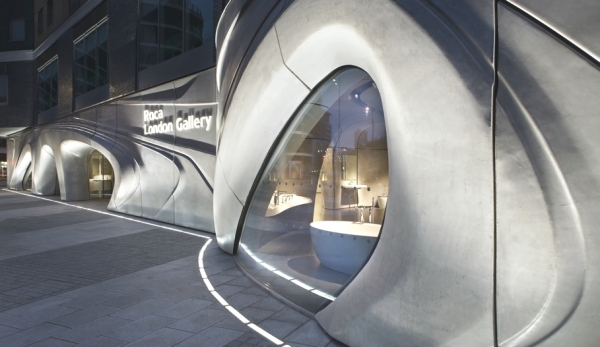 This concept represents the openness of the Roca London Gallery and its receptiveness to change and innovation. 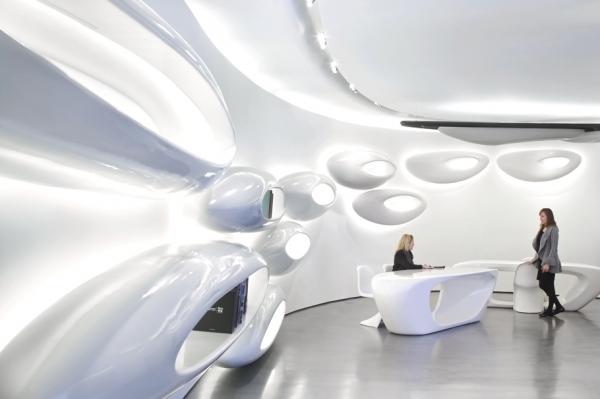 The gallery design is absolutely phenomenal with its outstanding curves and shapes, and its sense of flow, creating a sublime ease throughout the entire structure. 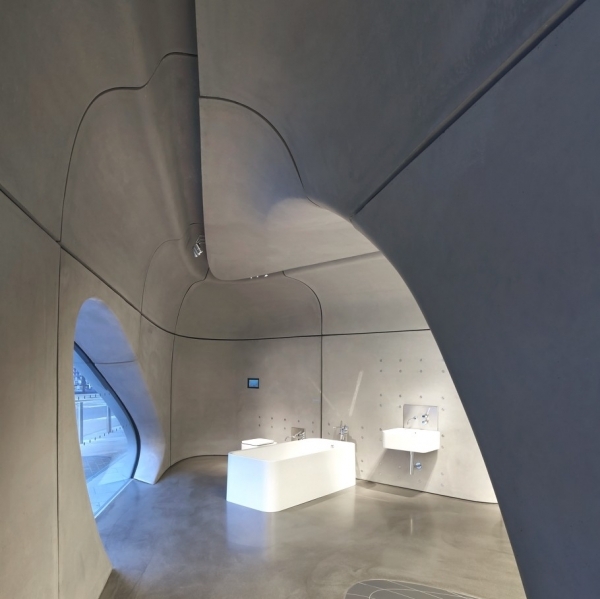 Inside this gallery design, you will find eleven hundred square meters of beautifully sculpted white concrete. We love the circles and ovals that adorn the wall, adding a significant amount of interest to the design. 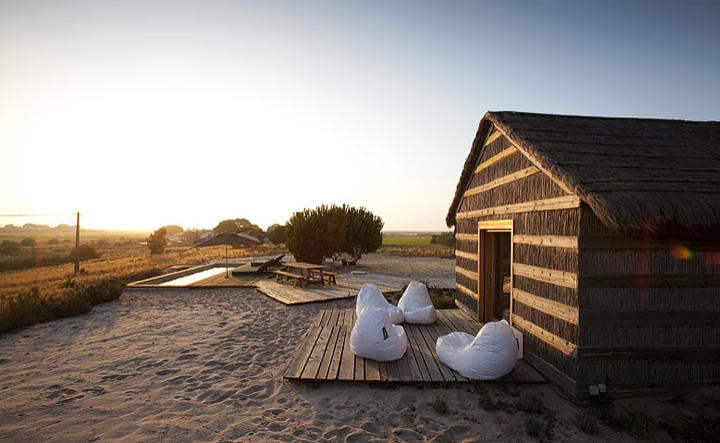 These shapes also provide storage: beautiful and functional. 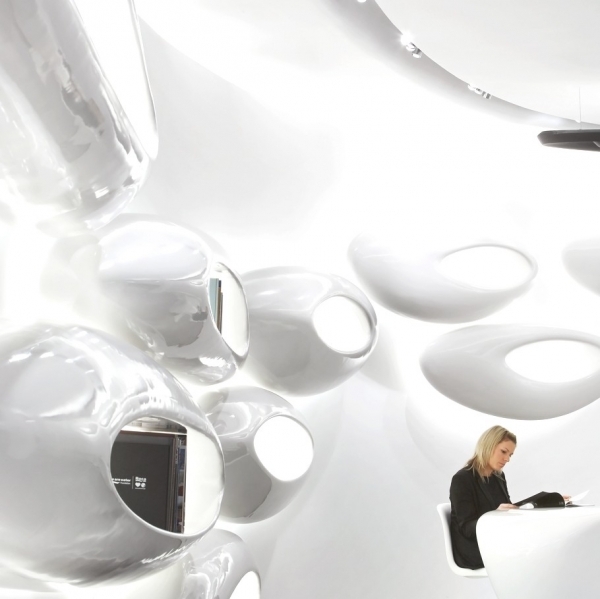 The gloss of the material is awesome, adding a magical quality to the space. 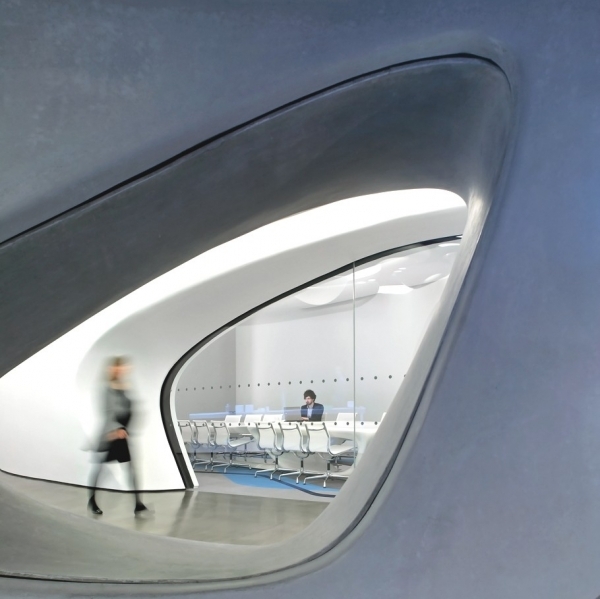 The seating areas are outstanding in this gallery design. 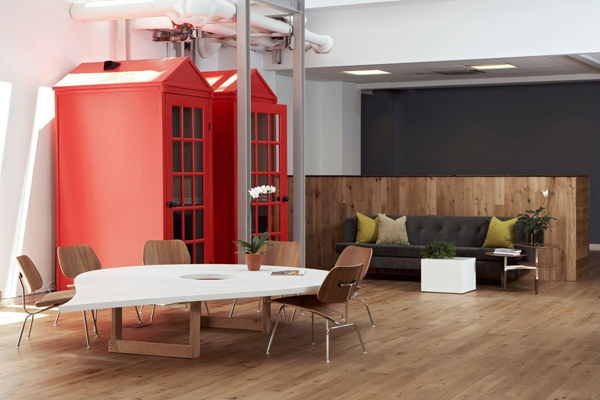 We love the curves and the cut-outs in the design of the tables. The chairs continue the fluidity seen in the rest of the space: simply gorgeous. The gray floors add a bit of an industrial touch to the design, anchoring and wonderfully complementing the bright white. The added black in the ceiling design is a lovely touch. 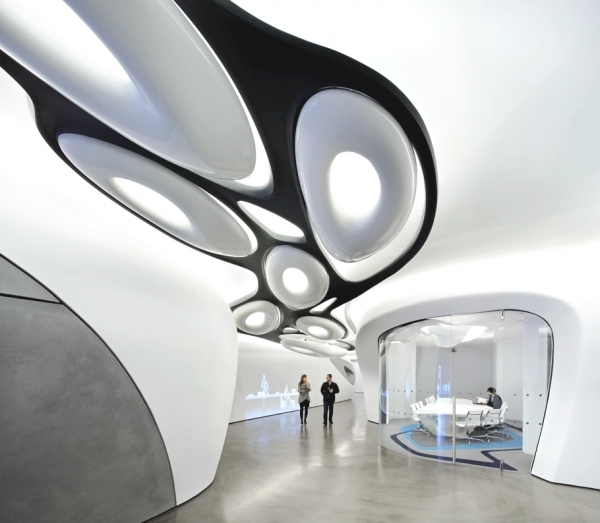 It provides an enticing contrast, defines the ceiling space, and adds even more depth to the intriguing ovals. Glass doors provide a bit of a separation for individual spaces, but not enough to break the fluidity in the design. We love the touch of blue in the room, it brightens and defines the space, but stays within the water concept through color and shape. 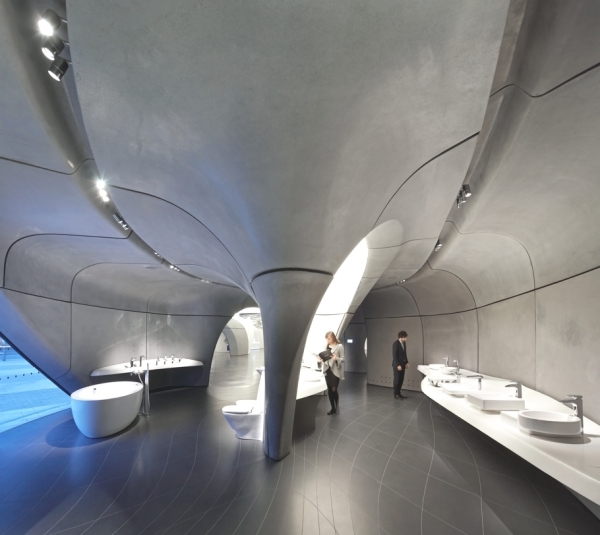 The bathrooms are on another level in this gallery. The industrial touch continues with the grays and the wall pattern. The curves in this room are absolutely amazing, adding interest and awe, and the fluid square floor pattern continues the beautiful idea behind this breathtaking space.